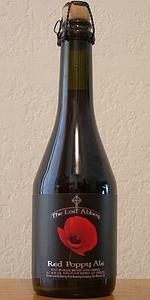 Red Poppy Ale is a veritable celebration of Sour Cherries in an explosion of aromas and tastes. Brewed from a brown ale base and aged in our oak barrels for over 6 months, this beer is not for the faint of heart. The Golden Poppy is the state flower of California and the Red Poppy is found in Flanders Fields where our inspiration for this beer comes from. 2012 version, and oh so wonderful. Tart, and still very effervescent. Tasting more sour than fruity at this point (but isn't that the point of keeping it until now). Cracked a 2014 to celebrate the release of the 2015! Poured from a 375 mL bottle into a .4L Bruery tulip. L: Pours a murky deep brown, with cranberry hues in the light. a thick cream/beige head forms on the pour and recedes quickly into a fine, but steady, head that laces the glass and falls away within minutes. S: Tart tart tart, with a subtle hint of funk deep within the glass. Enticing. Subtle cherry in the middle, but you can absolutely smell the sour. Minute alcohol. T: Oh yes. Just like it smells, really tart, and delicious. But with so much more cherry in the taste. Oak in subtle ways that mellow into farmhouse funky cherry goodness. F: Dry. Carbonated nicely and finely, but dissipates as it warms. Coats the tongue and cheeks nicely with resiny tartness. O: Great beer. I drink a large number of sours and this one stands up in its particular category. It is aggressive and may not be for all beer drinkers, or even sour drinkers. If you dig the style go with a classic American interpretation of it. Great sour cherry flavor. Very food aroma. There's no flavor in the beer world that efficiently captures the essence of fruit acidity, dryness, and robust savory flavor like the Flander's red ale. And its with acute attention to detail and legendary brewing prowess that the Lost Abbey pours their heart and soul into the style for a taste that doesn't just match those of the flemish regions, but even eclipses them. Hazy reds and browns swirl inside the glass, trickling with tawny golden edges, a frothy but loosely knit head pulls from the rusty body below and immediately entices the nose with mouthwatering sour cherry, black cherry, plum and all-things dark berry. With a pep of balsamic, the taste ushers in a mild fruit sweetness that seem from the distinctive black cherries, rung out straight off the branch. With that juicy succulence and robust blackberry, plum, black cherry and currant character washing over the palate, the piquant tang of the sour ale within begins breaking apart the sweetness and commanding the taste with its own robust acidity that's a medley of hearty cabernet wine and mature balsamic. Dry cider, chardonnay, weathered oak and a full sea brine finish gives the ale a decisive sour and savory finish. Medium-light on the palate, the ale trails toasty, nutty and almost chocolaty as its underlying savory flavors inch closely to umami status. But the high refreshment of the ale cleanses the palate with thirst-stripping lemon, lime and crabapple acidity and with an afterglow of cellar woods, cork and burlap. Appearance: A dark rose red, fairly appropriate in that sense, but there's just no head or lacing. At all. The body's color is pretty, but this wasn't just a matter of having no head or lacing, it was a matter of the beer looking flat, to be honest. Smell: Perfume, candy sugar, vanilla, licorice on the back end. A smell very reminiscent of some Flanders Reds I've had in the past, specifically Rodenbach, although this is an Oud Bruin. Taste: Metallic on the front end, which really, really detracted. However, I was beginning to think this was an issue with the bottle more than anything. Grass, vinousity, sourness. On the back end/aftertaste is a very lingering and surprising butterscotch-like sweetness, however, which was really surprising and nice. Mouthfeel: Slick, but way, way undercarbonated. Drinkability: Perfectly drinkable - not too sour at all, in my opinion. However, the flatness of the whole bottle was definitely a let-down. 375 ml caged and corked bottle. Served in a snifter, the beer pours a murky brown color with some tints of red, and about a half inch light tan head. Head retention was OK, and there isn't much lacing left on the glass. Aroma is mostly tart, the brew smells like tart cherries, oak, vinegar, and some funk. The taste is similar to the aroma, but there's also some red grapes noticeable too. There's also a long lasting tart finish. Mouthfeel/body is medium, and it has high but soft carbonation which eases up some as the beer warms. I think this is a pretty good overall brew, it's easy to drink and quite enjoyable. But because of the high price ($16.99 a bottle), it's going to be a very long time before I consider buying it again. Wow thought this exceptional for the style bottle poured into my Lion's Pride Chalice. alot is said about Lost Abbey beers this one opened with a loud pop and had nice carbination. A - Dark Murkyalmost brownish red hue with a bit of lacing. S - Nice dank cherry like smell. T - Lambic like sour background some vineagar nice. M - crispy leaves a real sour feel and stays with you. O Highly recomended for the style. Worth the try and I felt really good. Pours opaque red-brown with a white ring of bubbles. Sour cherry and oak with a nice buttercream and vanilla nose. Taste is a bit the same, but the cherries modulate between sweet and sour, with the sour being very similar to the Tomme. Brown sugar and malt back mixed with the brett to give it a funky finish.